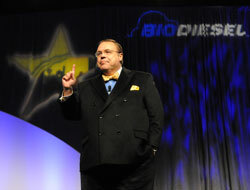 Economist Don Reynolds was the keynote speaker at the opening general session. He appeared on stage two years ago and predicted the problems in our economy. Today he started out on a very optimistic note in part due to his belief that we’ll continue to see a growing recovery of the economy. His comments were meant to help participants define what is the “new normal” in today’s business environment. You will enjoy his entertaining style filled with facts and figures that help you better understand what the future may look like. He thinks it’s looking very good.